Is your pool cover ready for a makeover? 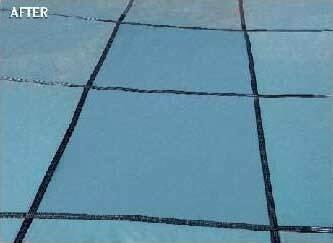 Have some holes or tears that need repair by a qualified pool cover manufacturer? Is the webbing or padding on your cover in need of repair? We have the answer for you. 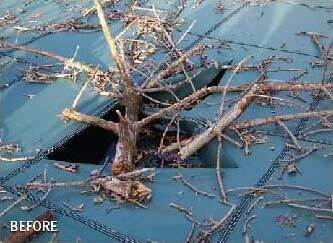 It's our pool cover repair program. This program has worked for thousands of homeowners across the US and chances are, it will work for you also. Fill out and fax us the safety cover repair form. When we receive your fax, we will send you a box for shipping the cover and a prepaid return label. That means the shipping is on us! When you receive the box, simply remove the hardware from your cover (buckles, springs, etc.) and put the cover in the box. Tape it up and place the prepaid return label on it and take it to a local UPS shipping outlet. After we receive it, we will check it out to see what needs to be done to make it serviceable again. You will receive a call from us with the repair and pricing information you need to make your decision on whether to repair it and also a replacement price if the condition of the cover warrants. If you decide to repair or replace the cover, we will at that time require your credit card information in order to complete the repairs. Should you decide to get a new cover, we can make an exact copy using our duplicate cover program so that you will not have to drill any new holes in your deck! The placement of the straps, cutouts, steps, etc. will all be precisley where they were before. Should you elect not to have the work completed or the cover replaced we will ship the cover back AT NO CHARGE TO YOU. Why waste your money if a new cover is not needed? If you would like to participate in this program, we encourage you to fill out and fax the safety cover repair form today as this popular program is run on a "first come first served" basis.